when water falls on tents and lakes. When I retyped the poem, I made two changes. One change was a line break/shape change. I started shifting lines around and decided...."Hmmm, maybe this would look cute as a tree!" I liked it. Then I reconsidered the title. 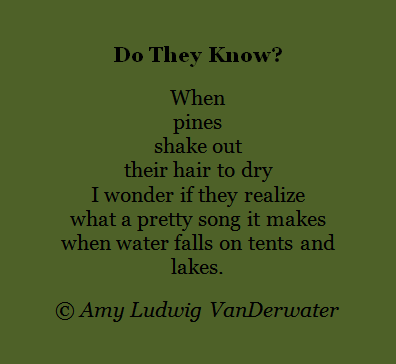 I always like imagining trees and rocks and natural things as having thoughts of their own, so I added to the personification of this poem by making the title a question, about trees and their self-knowledge. This is just a one sentence poem, a shortie. Could I add more? Yes. But for this one, I just want to say one thing, make one small observation and stay right inside of that observation. Save. Save. Save. That's some of my best advice for writers. Recycling bits of thought and poem allows you to see who you used to be and bump that up against who you now are. It was a joy for me to find this scrap, to remember trees from my past and to still wonder if they know their own loveliness. Last week, I shared my collaboration with Diane Mayr in Spark 18 here and here. This week, over at Diane's blog, Random Noodling, you can see behind the scenes of how she created one of her great layered pieces. I think it is fascinating to read these process posts, and I feel very grateful to have been paired with Poetry Friday regular Diane on this round! This week it is a treat to have author Kate Messner visiting Sharing Our Notebooks. If you are notebook keeper, you will want to visit here to peek inside her notebooks. If you are a teacher and your class keeps notebooks, this site is growing to be quite full and useful! Laura Purdie Salas is hosting today's Poetry Friday at Writing the World for Kids! Head on over to her place for the round up and enjoy the poem-festivities! About next week...right now I am on the schedule to host. But I have traded with Betsy Hubbard. So if you keep the calendar in your sidebar, please note that change. Poetry Friday on October 12 at Teaching Young Writers with Betsy Hubbard, and I will host here at The Poem Farm on November 30. What a nice little vignette you've painted! Really like this. Amy, I LOVE your concrete poem. The shape of your poem is also a TENT like you have included in this poem. Well done. Very cute! I do not work with shape poems much, but I should...so much potential for an added layer of communication! Love it, Amy. I posted a concrete poem (of sorts) myself this week. 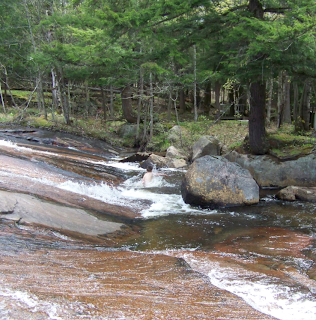 The sound of water shaking from a tree really is an enjoyable sound. What a charming poem! Love the idea of a droplet song :). Love the idea of keep only ONE thought inside the poem Amy, & you did just that for those of us who have experience camping in tents. Thanks for sharing about the revision too-good advice. This took me to the Adirondacks perfectly. I feel silly for not recognizing the tree shape until you mentioned it. That said, Andrew - my daily reader - picked up on it immediately. Well done! Love the poem. There is a loveliness to the sound of pine needle rain. Aaahh. Lots of "pine hair" in my front yard right now! I love concrete poetry. You make it so easy for kids to write by taking them through the steps and showing process!